Today’s Last Monday Book—Writing and Illustrating the Graphic Novel, by Mike Chinn—is a departure for me. I have no plans to write a graphic novel (and no skill to illustrate one). 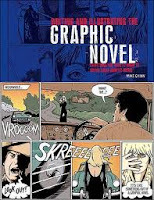 In fact, I’m pretty sure I rolled my eyes the first time I heard the term “graphic novel,” thinking it was merely a high-falutin’ name for a comic book. But my boys, my 12-year-old in particular, have been bringing home more and more graphic novels from the library, and I’m becoming aware of what a huge market it is. So I thought I would do a little investigating. Graphic novels are older than I thought. A Contract With God (1978) by Will Eisner is considered by many to be the first, and Eisner is credited with coining the term “graphic novel.” But in the 1930s, Lynn Ward’s novels God’s Man and Madman’s Drum were told entirely in woodcut images, with no dialogue or narrative. As an even earlier precursor, Charles Dickens’s novels, dating to the 1830s, were often serialized and heavily illustrated. And the graphic novel is not an American invention. Post-WWII Britain had its black-and-white “picture digests.” The ongoing adventures of Belgian George Remi ’s young reporter Tintin began in 1929 and have been translated into 80 languages. Japanese Manga dates back to the Occupation, and Japan is the world’s largest market for comic books and graphic novels. As for topics, well, anything goes. Superheroes and the supernatural are well-represented, but other bestselling graphic novels have covered such weighty subjects as the Holocaust (Maus) and the Iranian Revolution (Persepolis). Graphic novels are also great vehicles for adapting previous works, from Ancient Greek myths to more modern science fiction. After setting the scene historically and geographically, Chinn examines the elements of the graphic novel. Some of them—such as panels, framing, and speech balloons—are exclusive to the genre. But much of his advice regarding story elements—character development, pacing, exposition, overlapping plotlines—applies just as much to general fiction. Though I can barely draw stick figures, I enjoyed reading about the illustration process. The addition of artwork to a “grown-up” storyline adds a whole new dimension. This got me thinking about how all writing, from the most concise poetry to the longest fantasy epic, relies so heavily upon the author’s powers of visualization and description—whether we render those descriptions in words, pictures, or both. The next time I’m working on character or scene development, I’m going to think inside the frame and ask myself how a graphic novelist might see it. Are you a reader or writer of graphic novels? I'm a huge Joss Whedon fan, and I read his comic books. But I've never thought about creating one before. It would be an interesting challenge! I've been reading comics since my late adolescence and a few graphic novel. There great to read and writing one is similar to writing a screen play, though with a lot more scripting for the illustrator to get your gist. For adults there are a few great titles to start with but I would suggest "Sandman." It was the first foray into fiction by New York Times Bestselling author, Neil Gaiman. The 10 volume series of has won numerous industry awards and is just fantastic in my opinion. Given that they can be read relatively quickly, graphic novels (comic book compilations) can be a fun addition to your library.